Sweet mother of God, Barcelona are a force of nature. It’s currently about an hour into their match against Getafe. 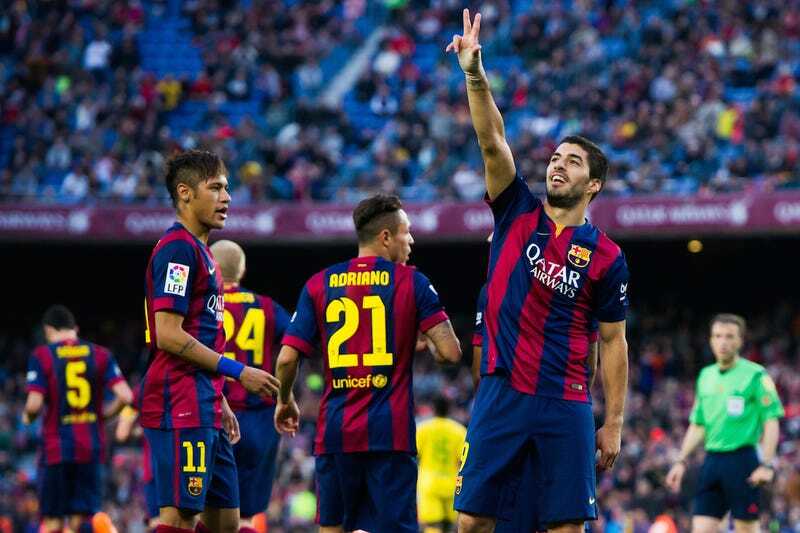 Lionel Messi, Luis Suárez, and Neymar have all scored. And those goals make up just five of their six total, each scored with some of the most outrageous skill you’ll see this year or any other. Somehow, Messi’s opening goal wasn’t the pick of the litter. His was a simple penalty, but he wafted it in with a delicate Panenka. The first pants-shitting moment came from the day’s second goal. Messi found Suárez in the box with that cross-throughball he’s made famous this season, and Suárez tracked the pass with his eyes and volleyed it home before it hit the ground. Without ever looking at the goal frame. The next came at the feet of Neymar, who looked like a Matrix character in bullet-time, feinting and sidestepping challenge after challenge in slow-motion before sliding the ball past the keeper. Old man Xavi then got in on the act with a crushed curler of his own from outside the box, bending indefensibly into the far netting. Then Suárez felt the need top Xavi by smashing in a similar bender as his teammate, only doing so at full-speed, with the ball whizzing past defenders like it was remote controlled. Oh yeah, and Messi did get a ridiculous goal of his own just after the break. This is what the best team in the world looks like.